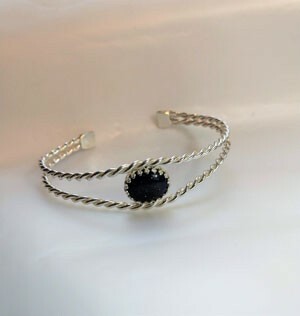 You will use sterling silver wire and paste solder to create this beautiful bracelet enhanced with a cabochon of your choice. You will be shown how to twist your round wire using a drill, then you will begin preparing your wire for soldering. You will create end caps on the cuff to make it very comfortable to wear. You will use a premade bezel cup to set the cabochon. Class fee includes all material, a complete photographed tutorial with step by step instructions and the use of instructors tools while in class.